Flat dumplings (napjak-mandu) are strictly a Daegu dish. They are slices of dough folded over tiny portions of Chinese noodles, Korean leeks and scallions, then sauteed in oil and topped with green onion. (Tip: Add soy sauce and pepper powder on it, as they catch the greasiness of the dumpling skin). I highly recommend you order dumplings and spicy, cold chewy noodles (jjolmyeon), which is noodles and veggies mixed with spicy pepper paste. The pretty plain taste of dumplings blends perfectly with the spicy flavor of chewy noodles, giving the dish a nice twist. It costs 8,500 won for the popular dumplings and chewy noodles combo. Although the little restaurant serves other dishes such as udon noodles and ramen, I’d stick to the dumplings. You can eat udon and ramen anywhere in Korea and I’ve never seen people eating them here, as most people go there for the dumplings. The place isn’t anything fancy, with its old and faded billboard, and the seven tables are always packed with local food lovers. You can sample flat dumplings at any traditional market or food alley in Daegu. 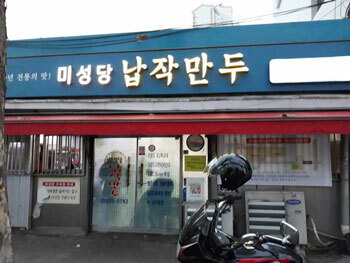 But, if you want the real deal, try the original in Misungdang.